Governments worldwide are driving initiatives to deploy broadband infrastructure and services. China has topped the world broadband market with the total broadband user base exceeding 320 million (CNNIC, 2009). However, a closer analysis indicates that broadband in China is less advanced in terms of penetration rate, access speed and price. Why China is lagging? Despite the fact that broadband performance and adoption are determined by both non-policy factors and policy factors, the OECD experience shows that smart national broadband policies are the key to broadband success. This chapter reviews and analyzes relevant regulations and government policies pertaining to broadband development in China using a multiple perspective model. The primary goal of this chapter is to examine how various policy factors interplay to affect broadband deployment and performance in the case of China. This research shows that the Chinese approach to broadband development has not produced desirable results. Several factors affect the growth of broadband. The most significant is lack of a detailed national broadband plan with clearly stated goals, performance targets and action plans for implementation. China’s regulatory arrangement and approaches to regulating broadband industry have failed to establish a well functioning and competitive market and to drive high levels of broadband performance, investment and innovation. Broadband has been considered as a way of boosting national competitiveness and bringing new opportunities to individuals and businesses in China over the past decade. China’s broadband sector has experienced an exceptional annual growth rate of 80 percent in the last three years. As of 30 June 2009, the broadband users reached 320 million while the Internet users reached 338 million (CNNIC, 2009). While the number of broadband users is an important metric, a more complete measure of a country’s position in broadband would consider penetration rate, access speed and cost. The China Internet Network Information Centre (CNNIC) reported that the broadband penetration rate in China was less than 25% as of 2009 (CNNIC,2009) while the Information Technology and Innovation Foundation (ITIF) data showed that more than 50% of households subscribed to broadband among the 30 OECD countries as of 2007 (Atkinson, Correa & Hedlund, 2008). Eighty percent of Chinese broadband users use ADSL access technology at a speed of less than 2Mbps, compared with the average download speed of 9.2Mbps in the OECD member countries (Benkler, 2009). The fastest broadband connection widely available in Japan is 100 mbps fiber optic service at a price of about $27 per month (Correa, 2007). In contrast, on average, a Chinese broadband user pays $25 per month for 1.5mbps ADSL service. With poor broadband coverage and performance, China today still lags behind in broadband internationally despite the fact that it has topped global broadband market with the total broadband user base exceeding 320 million. Access to high-speed and always-on of the broadband network is determined by a combination of the widely available telecommunication infrastructure and the accessibility and affordability of broadband services, which are closely related to government policies (IT Group, 1999). Other literature suggests that the underlying reason for broadband Internet access can be traced back to the policy factors in each country, because government policies governing the telecommunications service market and promoting information infrastructure have a significant impact on the performance of broadband Internet access. In common with other national governments, the Chinese government recognizes that rapid roll-out and adoption of broadband access across China is critical to long term economic development. Many national approaches to promoting ICT development have been taken since the 1990s. How have those strategic and regulatory developments impacted on broadband Internet access? To answer this question, this research investigates the relationship between policy factors, market environment and broadband access by using a multiple perspective model. The minimum necessary condition for participation in this information age is access to adequate network infrastructure. Without access to global communication networks, no country can participate in the networked world. Although much of the press coverage on the information economy has focused on applications such as e-health, e-learning, e-government and e-commerce, these content rich and data intensive applications will not realise its full potential unless quality broadband is widely accessible and more and more household adopt broadband. Correa (2007) states that ‘in the digital economy it is the speed and capacity of the network that matters’ (p. 1). There are many studies focusing directly on regulatory impacts on broadband supply such as Fan (2008), Howell (2008) and Prieger and Lee (2008). Fan (2008) looks at the influence of Australia’s government policy on broadband Internet access while Howell (2008) examines the effect of some regulatory factors on broadband diffusion rates in the case of New Zealand. Using U.S. data covering all areas served by major broadband providers, Prieger and Lee (2008) investigate the impact of telecommunications regulatory policy on broadband availability and the role of incentive regulation and local telecommunications competition policy in stimulating broadband deployment. This study is primarily looking at how broadband infrastructure and services have been provided in China and how the Chinese government policies can help to develop Internet infrastructure and promote affordable and equitable broadband Internet access in China. 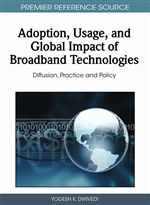 The objectives of this chapter are to examine how policy factors influence broadband access and identify what role the government policies have played in promoting broadband deployment and adoption in the case of China.